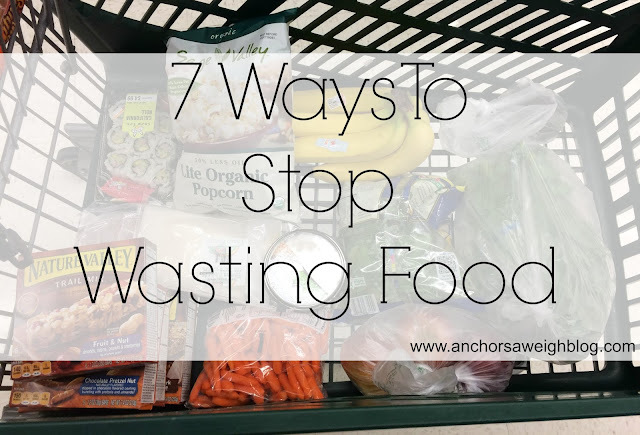 When Parker and I moved into our new house, we set a goal to stop wasting food. It's been a struggle since we got married to find the right balance of having enough food around the house without wasting it, and we were ready to take the bull by the horns. I've always planned out our meals. I would go to the grocery store once a week (usually every Sunday) and buy stuff for the dinners I planned for the week, lunches, snacks, etc. When we first started out this whole married life adventure, I was planning 5 meals a week. 5! I wanted to be the perfect wife that had a fresh, warm meal on the dinner table every night. 5 may not sound like a lot considering there are 7 days in a week, but almost every meal yielded at least enough for 4 servings, and there are only 2 of us. Our refrigerator was stuffed with leftovers, and we couldn't eat them fast enough. 4 years into marriage, we realized something had to change. I hated wasting good food and money, and so did Parker. We started talking about ways we could make sure we eat what we buy and came up with 7 strategies to implement going forward. Yall, it has made a world of difference! Not only are we spending way less at the grocery store each week, but we are actually eating what we buy. 1. Make more frequent grocery trips. I wanted to only go once a week, so I would overbuy just to ensure I didn't have to go back. Only buying the minimum of what we actually need may mean I will have to make another trip later on in the week, but it will also mean less wasted food. 2. Don't plan 5 meals a week. This sounds extreme, but I now only plan 2 meals a week. Most meals make 4 servings or more, and since there are only 2 of us, that will feed us at least 2 nights. Plus, things just come up and life happens. If someone invites us to dinner or we decide to do an impromptu date night, I don't have to feel guilty about all the food we are wasting. If 2 meals isn't enough, I'll just make another quick trip to the grocery store later in the week. 3. Look in your freezer before grocery shopping. I sometimes buy meat in bulk when it's on sale and put it straight in the freezer. That's cool, except then I forget that it's there. I now make a point to look at what meat I have sitting in the freezer and plan meals around that. 4. Buy the smaller milk carton. I used to buy the full gallon each week and we were wasting so much milk. We aren't huge milk drinkers and only use it for cereal or chocolate milk after a workout, so we just couldn't drink it fast enough before it went sour. Plus, I switched to almond milk recently, so Parker doesn't come close to finishing the real milk on his own. I buy the half gallon now, which is the perfect amount to get us through a week. 5. Buy lunch meat from your local deli instead of the prepackaged stuff. The prepackaged lunch meat is fine, but it usually only comes in quantities of a pound or larger. We don't eat enough sandwiches during the week to eat a pound of lunch meat quickly enough. Instead, I started buying meat and cheese from the deli in 1/2 pound or even 1/3 pound quantities. It's fresher, tastes better, is cheaper, and we don't waste it. 6. When the bread is about to go stale, start serving it as a side of toast with dinner. Another thing we have trouble eating fast enough is a loaf of bread. You can't really buy bread in smaller quantities, so I throw a couple of pieces in the toaster and add butter for a dinner side, or I'll put it under the broiler for a few minutes with some butter/garlic/cheese for variety. Either way, it's a great dinner side and will help you eat the bread before it goes bad. 7. Leftovers are your friend. I wanted to be superwife when we got married and have a new meal on the table each night. I now see that's not realistic. When we have leftovers, we will eat those before I cook again. You can even use leftovers as part of new meals so you don't have to eat the same thing all week. Last week, I threw some chicken/salsa in the crockpot for chicken tostadas. It made way too much, so I took some of the leftovers and made chicken quesadillas for lunch. Get creative and eat those leftovers. These are just the tips that have worked for us! What are some of your tips for not wasting food? We freeze food before it goes bad. Bread loaves get frozen...and you can easily take a slice of frozen bread and toast it. I also buy produce in bulk and process and freeze it. This weekend, I froze a gallon of blueberries from a local farm, several ears of sweet corn (just preboil and then freeze them), and a bunch of baked okra that we will enjoy later. I also freeze leftovers if we won't get to them fast enough. Soups freeze wonderfully in mason jars for a two person portion. And it's easy to let them thaw out in the microwave, or run the jar until warm water until it thaws. My mom was raised in a family of 9, so she taught me to cook how she knew and to always have extra food. I am really guilty of making enough food for 6 when it's just the two of us. I also cut down on the fresh produce I buy (I used to buy multiple bags of salad a trip) because Mac's work schedule can result in him coming home super late and not eating too much. We have this problem too. Usually, Dan is able to take the leftovers for lunch so that we can continue with our meal plan... but there are always containers of leftovers in our fridge anyway! :-/ We hate that. I do plan five meals a week, but maybe I should try cutting it to four first and see how that works. We try to only eat out once a week, but we sometimes do twice if friends invite us. These are great tips! We don't really have the problems of the food not getting used, just because there are so many of us- but we did have a problem with eating the leftovers in the back fridge, so I made a simple sheet of paper hung on the front fridge that told all the leftovers and when they need to be eaten by so nothing gets thrown out! I hardly ever waste food; I'm definitely the type of person who can eat the same thing for every meal for like a week. My mom, on the other hand, is not. We waste so much bread it's ridiculous, because we never make it through an entire loaf unless we're super intentional about eating it basically every day-- which I don't even like to do, but I love the idea of making it into a garlic toast! The thing that has helped me the most (that I need to work on still) is preparing food right when I get home from the grocery store-- otherwise the week gets busy and we get lazy/tired and I don't feel like taking the time to chop up veggies and they get wasted-- if I do it all in advance, they're already good to go! We have the opposite problem! The neighborhood kids are constantly at my house raiding our fridge and my kids eat so much food! Lol. I love leftovers, so this is our biggest food saver. The toast tip is a good one, as we are always throwing out bread. Now that we have the counter space to leave it out, we will start doing that! I freeze meat and cheese which saves me money and food in the long run. Great tips!